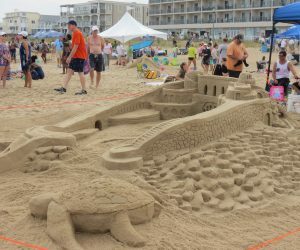 The 40th annual Sandcastle Contest hits Rehoboth Beach on Sept. 8. Hosted by the Rehoboth Beach-Dewey Beach Chamber of Commerce (RBDBCC), teams and individual competitors are encouraged to express their artistic flair in the sand. In addition to traditional sandcastles, past sculptures have included mermaids, Funland rides, pyramids, dolphins and Olympic athletes. The contest will be held just off the Boardwalk on the beach in front of Funland between Delaware and Laurel Avenues. The contest is open to adults and children of all skill levels. Registration is free and participants can sign up under the blue Chamber tent between 11 a.m. and 2:30 p.m. the day of the contest. Sand sculpting may be started at any time the day of the competition but must be completed for judging by 3 p.m.
Who takes home the trophy? You be the judge! The public is invited to participate in the People’s Choice Voting held from 3 – 4 p.m. the day of the competition. Vote for your favorite adult, youth and business division sandcastle by completing an event evaluation. Winners will be announced at 4:30 p.m. Trophies will be awarded to the to eight People’s Choice favorites in both the adult and youth divisions, and one trophy will be awarded in the business division. Children ages six and under will receive a souvenir squirt toy while supplies last. Participants will be divided into four divisions: Business, Adult (15 and older), Youth (7 – 14) and Smiley division (ages 6 and under). There is no limit to the number of participants per team. Piles of sand must be formed by manpower only. Mechanical assistance is not allowed. To be judged, creations must be built within event event “feather” flag boundaries. The sand sculptures may contain only objects natural to the beach (shells, stones, seaweed, etc.). Participants must stay away from the dunes and the dune grass. The use of food coloring is prohibited. Sculptures may not be dampened or sprayed with any solutions other than water. In other words… NO STICKY STUFF! Sculptures must be finished by 3 p.m.
Children under 12 must be accompanied by an adult when registering for competition. The Chamber encourages young participants to enter and asks that parents provide minimal assistance to youth entries. Sculpture subject matter is left to the artists’ imagination; however, the Chamber advises avoidance of political/controversial themes. RBDBCC members are encouraged to compete in the business category and represent your company in the sand! Entries will be judged by the public during the Peoples’ Choice Voting. The winning business will receive a trophy, a free Beach Blast email and bragging rights for the entire year. Beachgoers who would rather watch than create can join in the fun throughout the day. Local sand sculptor Darrell O’Connor will lead the building of a community sculpture. Participants can sign up to lend a hand at the contest registration tent. Children are invited to create a sand art keepsake craft on the beach to commemorate their contest experience. Kids can create their sand art craft under the white tent on the beach at Delaware Ave. on contest day 12 – 4 p.m. There is no charge for this activity, donations are welcome. Spectators are welcome to view the incredible creations upon their completion beginning at 3 p.m., free of charge. Sand sculpting artist Darrell O’Connor will be on the beach at Rehoboth Ave. & the Boardwalk from 5 – 7 p.m. on Friday, Sept. 7 giving FREE sculpting demonstrations and lessons. Learn some skills, then put them to use during the competition on Saturday. This event is weather dependent. In the event of bad weather, set up and registration may be delayed. If bad weather continues, this event may be postponed until the following year. If bad weather occurs during the contest, participants may continue at will or at the discretion of lifeguards. Judging may be cancelled at any time if warranted by weather conditions. In the event of inclement weather, updates will be posted to the RBDBCC Facebook page. Recorded updates will be available by calling 302-227-2233. This event is produced by the Rehoboth Beach-Dewey Beach Chamber of Commerce and funded in part by Southern Delaware Tourism. For more information, visit the Rehoboth Beach-Dewey Beach Chamber of Commerce’s website at www.beach-fun.com.